To buy please go to the All-Season House page, either click on the link or use the menu above. The picture above shows a Medium All-Season House with a Sunroom. This page is designed to tell you everything you need to know about our All-Season Houses for tortoises. Describing each feature of the houses in detail to help inform our customers about their intended purpose and functions. The house comprises a heated hide (when using a heat lamp) on the left-hand side and a dayroom or sunroom on the right. 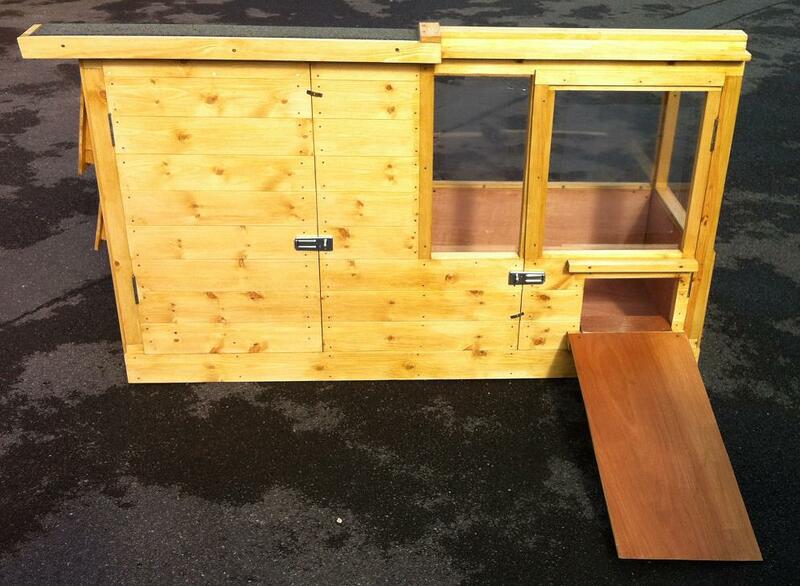 In principal, they are designed to house tortoises all year round outside. Their main functions are to provide shelter, heat and UV provision as well as a good temperature gradient and space for a water bowl if necessary. The house comprises a heated hide on the left-hand side and a dayroom on the right. There are two full height doors on the front that give complete access to the two sides of the house. The roof is not removable. 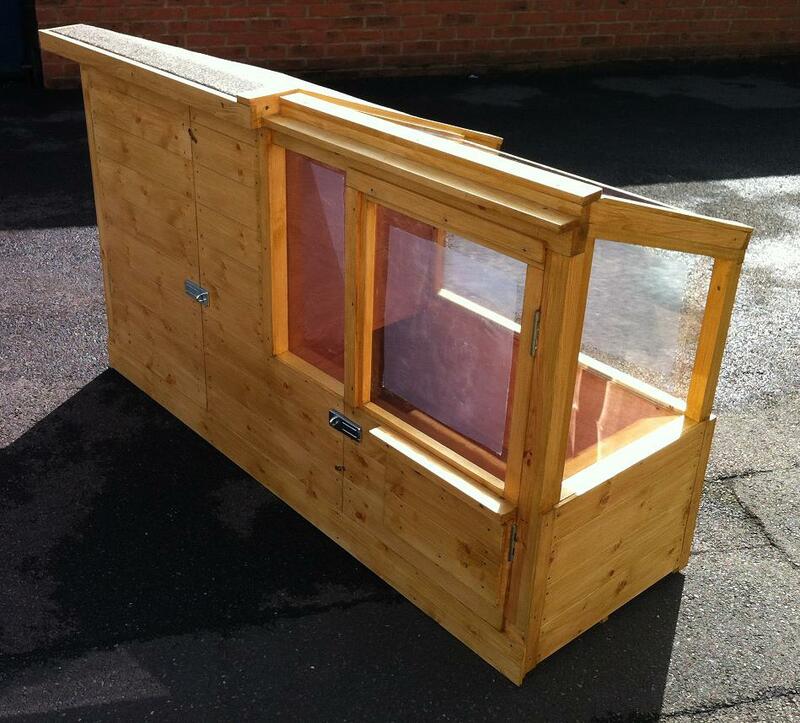 All-Season Houses are designed to be tall enough to house a heatlamp in one end and long enough to provide a good temperature gradient whilst keeping the tortoises warm despite being outside. 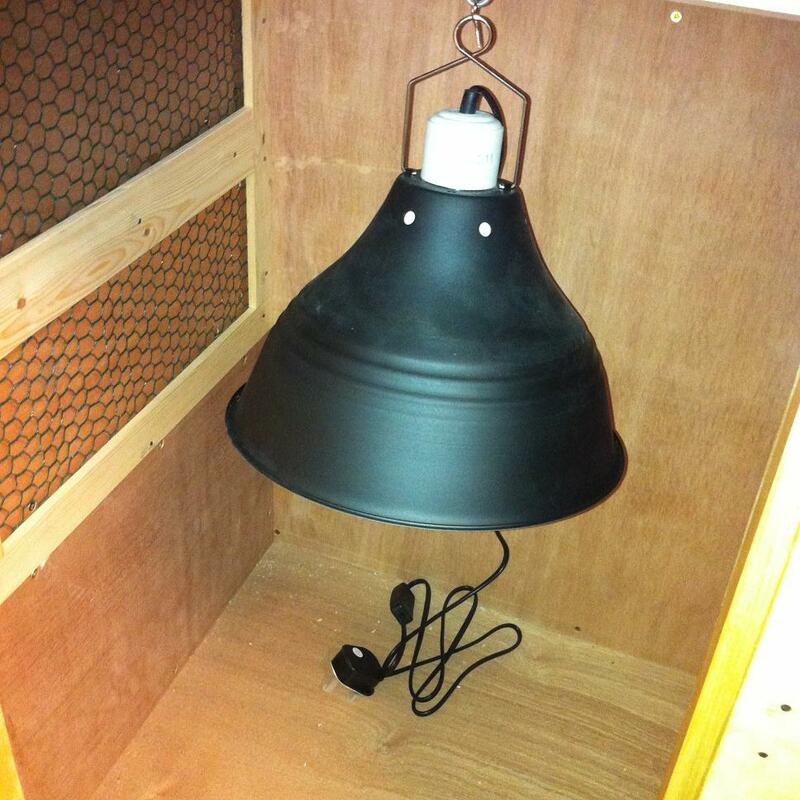 Other tortoise houses on the market does not take this into consideration, The heatlamp should be hung from the ceiling via the metal loop placed (supplied and fitted) in the left hand side of the house to create a large heated hide. The heated hide provides ideal heating facilities for keeping your tortoises outdoors all year round and particularly when the temperature is below 15 degrees C. This is usually true for around 8-12 months of the year in the UK and hence a heatlamp is essential for keeping tortoises outdoors. The All-Season houses are large enough to provide a good temperature gradient. This is especially important in the cooler months when you would ideally close your tortoises in overnight whenever the temperature falls below 15 degrees C outside. 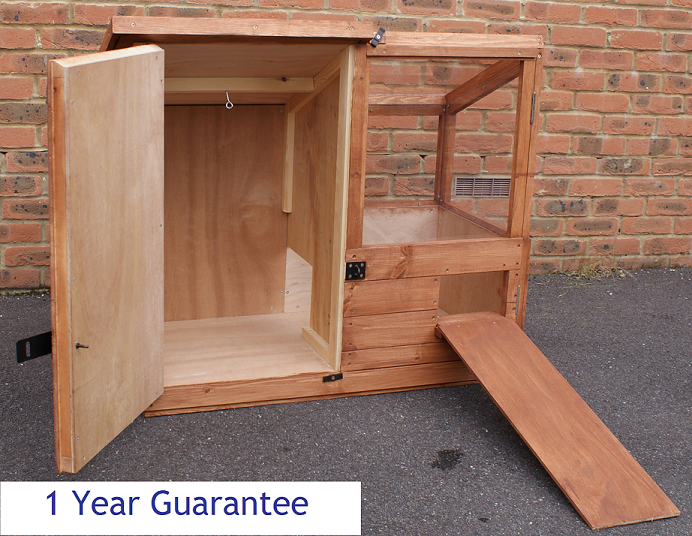 This is acheived by removing the ramp (that slots on) and replacing the tortoise door secured with turn buttons (supplied and fitted) inside the house to ensure good security. Drip Mould is fitted above the Tortoise Door to keep the area below dry from rainwater. On cooler days we have observed that tortoises will sit under the heatlamp to get thoroughly warmed up, venture out and return again to bask several times a day if the daytime temperature is below 24-25 degrees C outside. They seem to be very good at remembering where their heatlamp is after only a few days in their new house. An outdoor UV lighting unit can be placed on the internal centre wall facing away from the heatlamp, so you can create a day room in the right hand side of the house. Due to the low UV levels in the UK compared to most natural habitats of tortoises we recommend that you provide artificial UVB light by fitting an Outdoor UV unit as supplied in our Heat and Light Packs. The sunroom is fitted with special polycarbonate windows. This allows natural UVB light from the sun to filter through. The polycarbonate windows allow maximum exposure to natural UVB light and are much more thermally insulating than glass too. Glass filters out 90% plus UVB light which is essential for calcium uptake by tortoises. These polycarbonate window are not the normal polycarbonates in which are found in greenhouses etc. Premium insulation is provided by an air cavity and high quality Airtec double-layered foil with thick bubble-wrap within it.Outer walls are finished in Tongue and Groove cladding.The Airtec foil insulation in situ. This is before the cladding layer is added as shown in the top right of the second picture. The houses are fully insulated to protect against the cold, the wind, wet weather and over-heating in the sun. As a result the All-Season Houses are very energy efficient housing. The walls, floor and roof are double-walled with insulation in the cavity. 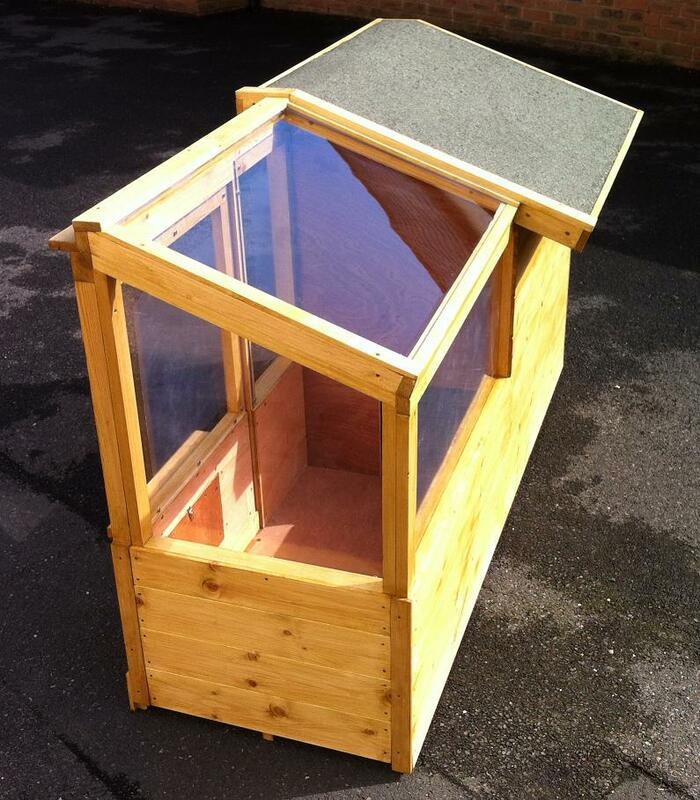 The roof is fitted with high quality felt and the outside is painted with high quality weather-proof stain. Water-resistant good quality WBP Plywood is used throughout. 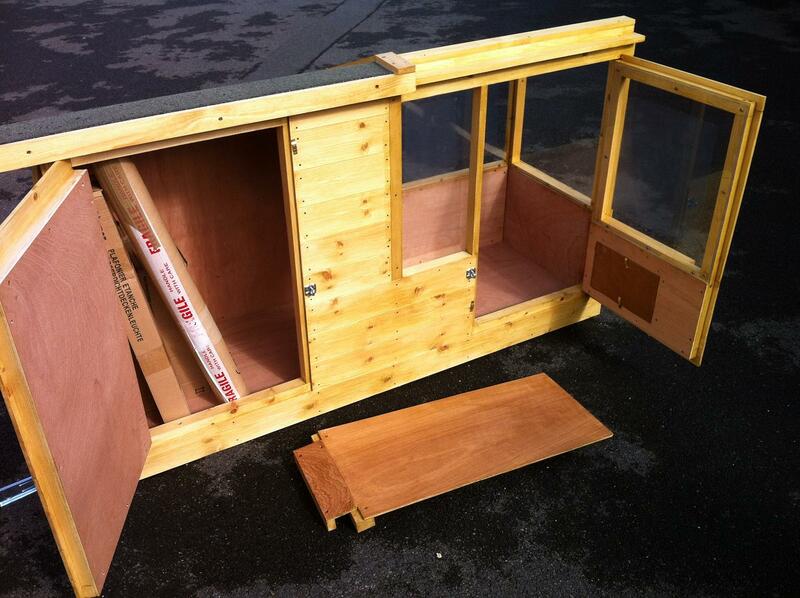 There are drip-moulds fitted above the tortoise and main access doors on the sunroom side. The weatherproof staining should be supplemented with a final coat after transportation and at least yearly after that unless stated otherwise on the woodstain manufacturers guidelines. We use only low-medium VOCs (Volatile Organic Carbon) products that are water-based and safe for use with animals when dry. Please ensure the All-Season house is solvent free when housing your tortoise, if necessary rub off excess stain with a cotton rag and dispose of it responsibly. The golden rule is that if you can smell the stain, they are breathing it in too. Upgrade colour option is available for these houses. Doors can be locked with padlocks and the windows are made of polycarbonate security glazing that has high impact resistance. The ventilation windows have mesh secured inside them to prevent access through them to ensure the safety of your tortoises overnight when you may need the air vents open. Hasp and Staples are supplied and fitted for these doors. Add-on Tortoise Runs, Hasp And Staples (for Tortoise Runs), Weatherproof Padlocks, Heat and Light Packs, Electrical Installation, and colour upgrade are available for these houses. IMPORTANT SAFETY ADVICE: These houses are very heavy. These houses cannot be lifted by one person. You must seek advice before moving theses houses. These houses are hand made using the best quality material available. 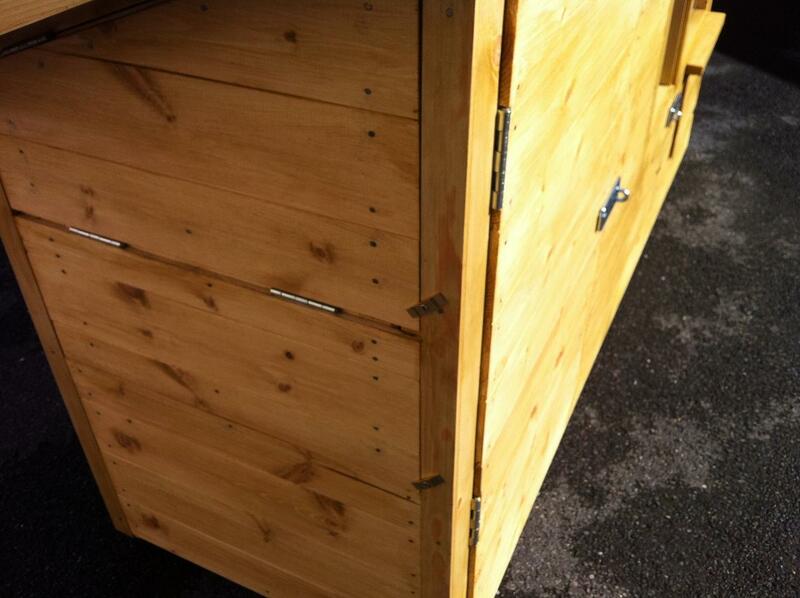 The wood Cosy Tortoises uses are of very high quality, purchased untreated and has a smooth finished. These houses were designed by tortoise keepers.